“These things I have spoken to you, so that in Me you may have peace. We all get discouraged. At one time or another — over one thing or another. Discouragement seeks to continually assault our plans, our purposes, and our pursuits. We get discouraged in our workplaces, our homes, with our co-workers, friends, loved ones, and acquaintances. By attacking our thoughts with a barrage of negative messages, Satan seeks to steal, kill, and destroy the relationships we have and the hopes and dreams God places on our hearts. One moment we are inspired, enthusiastic, and ready to take on the world — and then we run across someone who, intentionally or unintentionally, deflates our enthusiasm, fills us full of doubt, and ultimately sends us running in the opposite direction. Sometimes it isn’t even another person who punctures our passion, quite often, it’s our own negative self-talk that convinces us not to do the very things we sense we are being called to do. If we let it, discouragement can and will keep us from adventuring into unfamiliar territories, taking on new challenges, and saying “yes!” to the opportunities and adventures God has planned for us. So, what are we to do when discouragement sets in and threatens our quality of life? Ask God for wisdom and discernment regarding the thoughts and feelings you are experiencing. Renew your mind by allowing God to change the way you think. Let scripture speak to your situations and circumstances to encourage and inspire you, and give you hope and guidance in your judgment and decisions. 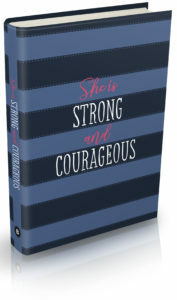 Arrange a time to share your discouragement with a trusted friend who will encourage you and give you godly advice. And return the favor by being a trusted and encouraging friend to them. Once you’ve prayed, searched God’s Word, and sought godly counsel, write down the lies you’ve discovered in the process, ones you’ve been tempted by Satan to believe about yourself, your situation, and others. Then locate specific scriptures that override those lies, write them on sticky notes, place them where you will see them often, and let truth set you free from your discouragement. How will you deal with your discouragement today?